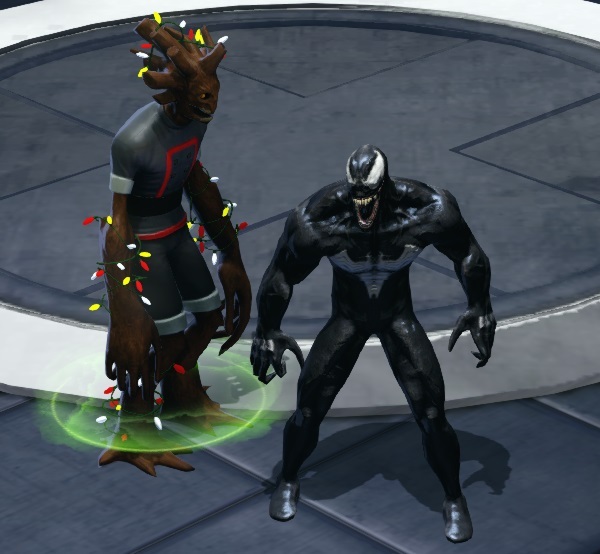 Marvel Heroes finally released Venom as a playable character. I’ve been looking forward to playing as him since they teased him nearly a year ago, and I have to say it’s been worth the wait. He has a really interesting mechanic in that his mana (normally known as spirit but renamed ichor specially for him) only regenerates when you use attacks that do damage at the cost of health, and many ichor-burning attacks regenerate health. It’s a really cool way to represent the symbiote/host relationship, and the double resource management makes for an interesting alternative to many of the “hold right mouse button to win” characters that I’ve played in the past. Like most characters in Marvel Heroes, his “rotation” is sweet and simple: build ichor and take out trash mobs with his AoE, then hit the survivors with the more powerful ichor based attacks, either ranged or melee depending on the situation. If I’m running low on health, I can use my basic (left mouse button) attacks. I’ve had a hard time deciding if I prefer the high damage melee or the long ranged one, but I’m starting to lean toward the ranged one. After all, they both regenerate the same amount of health, and I have other skills that are more efficient at dealing damage, this one is for keeping me alive. Plus, if I’m in a tough spot I’d like to be able to keep as much distance between myself and whatever happens to be shooting at me at the time. I’ve loaded up on health regen gear so far, so it hasn’t really been much of an issue, but when bosses start hitting hard it’ll be nice to be able to build my health back up quickly. 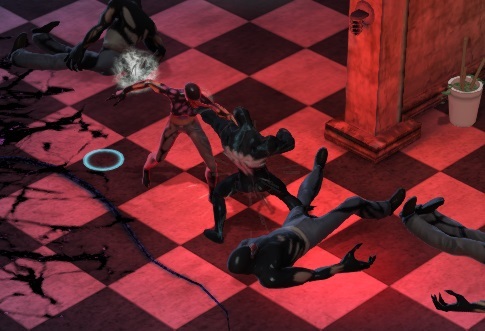 A little strange was the quest Symbiote Infestation, which has been in the game since launch, that had me fighting off symbiote infected office workers, including a section that had me activate a Sonic Emitter that’s supposed to disrupt the sybiotes’ hold over people. Yet I was completely unaffected. Apparently my symbiote has his soundproof earplugs in. I suppose it’s not any stranger than having multiple Human Torches or Thors running around in the same room, but it was somehow more unsettling to know that I’m fighting myself. Ironically, when I got to the room at the end where I’m supposed to fight boss Venom, the cutscene bugged and wouldn’t let me continue the quest. I guess I confused it. Also this December I got the Holiday Groot team-up from a giveaway in the newsletter. He’s my first team-up, and, while his festive lights may look a bit tacky year-round, I love Groot, and I see no reason to spend money/splinters on a team-up if I already have a free one. He adds a little bit of tanking and damage, but honestly I haven’t really needed it yet, so I can’t really say how good or bad he is. I’m sure I’ll be changing my tune if I ever get to extreme difficulty, though. Either way, I’m glad to have the extra inventory space he adds. I continue to be amazed at how far Marvel Heroes has come. At launch, it was pretty much unplayable if you didn’t pay money; the free starter characters were mostly garbage (especially The Thing, the character I started with), and there wasn’t much hope of getting new ones (hero tokens dropped rarely only from certain bosses). The Eternity Splinter system, frequent giveaways, and daily rewards mean that I’ve never been tempted to spend money on anything but heroes, and I’ve bought only two of the eight heroes I own. Unfortunately, it still has the nagging problem of being a little lacking in content, and the fact that most things are instanced and you can do everything alone doesn’t give it much of an MMO feel. It’s more of a microtransaction-heavy single-player ARPG with a few multiplayer hubs. They’ve tried a few things to bring players together, but it ends up feeling more like a mini game that you can’t do on your own to distract you from the main game. I can’t say it really bothers me too much, but it sometimes feels a little gimmicky.